If you ever watch Giada on Food Network, you will understand why I spelled bruschetta like I did in the title of this post. In Italy, bruschetta is actually pronounced "bru-sket-ta", because c-h-e makes a "k" sound. For example, in Italian, the word che (meaning what?) is pronounced, "kay". Also, to take it a step further, (as a sidenote) the letters "ci" together is actually pronounced "ch"... which is why everyone calls my Mom-Mom, Mary Chip, since her last name is Cipollini. Signora Camp would be proud. 1. Toss the first six ingredients in a large bowl, along with 1/2 of the garlic, and 1/2 of the olive oil. 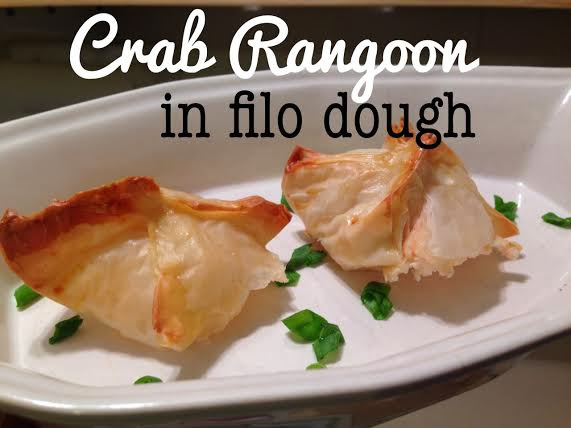 Cover and set in the fridge to marry flavors. 2. Meanwhile, slice bread in small pieces, about 1/2-inch wide (as pictured at the bottom), and arrange on a baking sheet. Mix 1/4-cup of the remaining olive oil with the rest of the garlic. Drizzle over bread and bake on 375 degrees until golden brown and crisp. 3. Mix the goat cheese, remaining olive oil, fresh parsley, salt and pepper in a bowl and incorporate well. After the bread has finished and has had time to cool, cover the bread with a layer of goat cheese mix. Repeat until all bread has been covered. 4. Arrange goat cheese crostini on a serving platter and spoon the bruschetta over the slices. 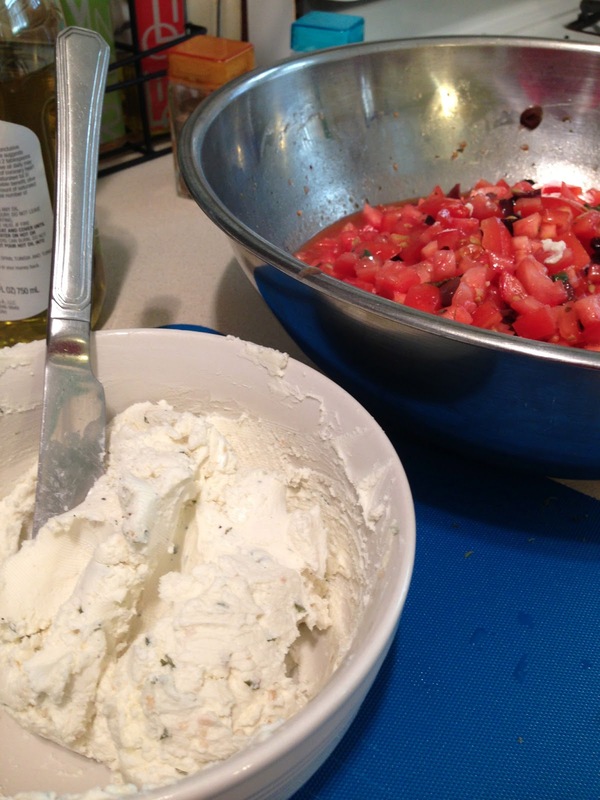 Serve any excess bruschetta in a bowl on the side. Additional Tips: I like to add roasted marinated eggplant, fresh mozzarella cheese, capers, crabmeat, diced shrimp, and much more! 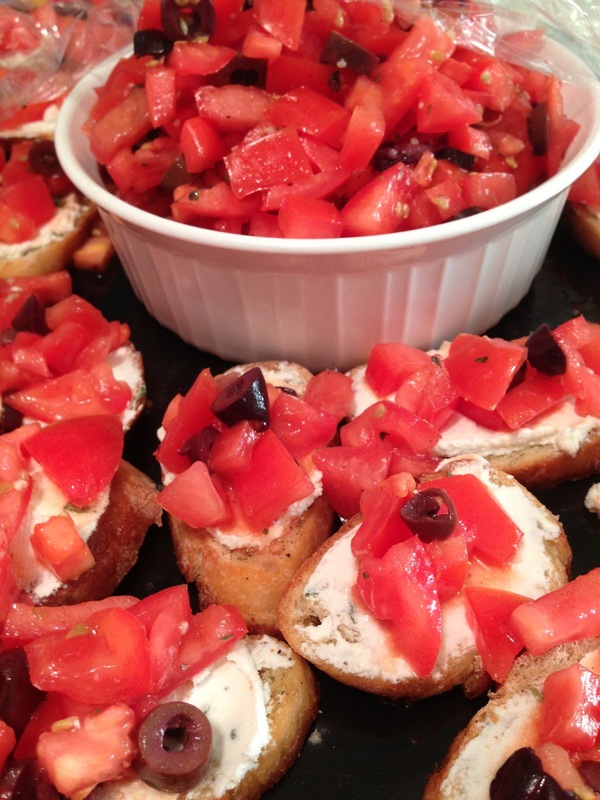 Let me know your favorite bruschetta recipes!